First released in 2005, the Receptor hardware player makes it possible to run virtual instruments and plug-in effects outside of a computer. If that sounds like heresy, consider the advantages: computers aren't designed for stage use or road travel, are susceptible to vibration unless fitted with an SSD drive, often have fiddly AC adaptors and require a separate MIDI interface. The Receptor, on the other hand, dispenses with annoying 'wall wart' cables, has built-in MIDI as standard and can be securely screwed into a rack for stage use and touring. In other words, it functions like a piece of pro audio equipment. The Receptor VIP is Muse Research's new entry-level model, which replaces the Receptor 2+. VIP is short for Virtual Instrument Player, though buyers are at liberty to assume the usual meaning if it makes them feel special! SOS reviews of earlier Receptor models can be read online at /sos/mar05/articles/muse.htm and /sos/jun10/articles/receptor2promax.htm. In this review, we'll concentrate on the new features implemented in the VIP, and give an overview of its operation and factory sounds from the viewpoint of a gigging keyboardist currently 'resting between engagements'. The Receptor VIP is housed in a rugged, black steel and aluminium 19-inch chassis with built-in rack ears. At 2U (3.5 inches) high and weighing around 15 pounds (6.8kg), it feels reassuringly solid and heavy, although you can lift it up without damaging your back muscles. The unit ships in the UK with a standard 13-amp mains cable, thus avoiding the horrible 'wall wart' AC adaptors that manufacturers foist on buyers. Furthermore, its internal auto-ranging power supply works with 100-240 volts, 50/60Hz mains supplies, which means you can use it all over the world without having to hire a power transformer. Powering up takes about 35 seconds, which I don't need to tell you is a lot faster than most computers. The acoustic noise levels that Martin Walker mentioned in his 2010 SOS review of Receptor 2 Pro Max weren't apparent in this model; some soft, non-obtrusive fan noise is evident when you put your head a few inches from the case, but at a normal working distance I doubt anyone would notice it. An uncluttered front panel comprises two 'combi' jack/XLR inputs with individual gain controls and LED meters, a headphone socket, 48V phantom power for mics, and a USB port intended for an iLok dongle, USB keyboard or mouse. Rather than leaving your iLok key protruding from the front of the module (a recipe for disaster at a gig), you can park it inside the VIP's 'Dongle Garage', a safe haven within the underside of the unit, accessible via a removable panel. The front-panel master volume control affects both headphone and output level. On the back are two quarter-inch jack line-level inputs and outputs (but no digital I/O), a footswitch jack and a solitary MIDI In socket. There's no MIDI Out or MIDI Thru, the first time I've seen those missing on a sound module. A MIDI Out would be pointless, but a Thru would have been nice for daisy-chaining other pieces of kit. Rear-panel computer connections include four USB ports, an Ethernet port and a 15-pin VGA connector for hooking up a monitor. At the back of the Receptor VIP are the usual computer-style connections, a pair of audio inputs and outputs and a footswitch input on quarter-inch jacks, plus a MIDI In port and a socket for the IEC power lead. The Receptor VIP comes pre-loaded with 4GB of free virtual instruments and effects, including a 900MB piano. Also included are sounds that work for a demo period of anything from 15 to 30 days, giving you the opportunity to 'try before you buy'. Notable among these are Native Instruments' excellent Komplete 8 collection (see details at www.native-instruments.com/en/products/komplete/) and a selection of guitar, bass and reverb effects from IK Multimedia. The 'Amber Lite' grand piano is a modelled rather than sampled instrument, which accounts for its ultra-smooth dynamic response. Although lacking the very soft layer that you'd need for sensitive solo playing, it's a pretty good all-rounder that would satisfy most gigging keyboardists' needs; in fact, when played loud, its bright, assertive tone would be an asset pitted against the racket made by guitarists and drummers. Programmers will enjoy some of the great samples found in the rock and jazz drum kits. A creditable range of basses includes a solid-sounding upright, a highly playable Jaco-style fretless, and numerous slap/funk electrics, all sounding good and fat. Sorry, phat. I found the acoustic guitars generally suffered from too much attack, but managed to have an extended jam on the more mellow 'Steel String 2' instrument. Synths are a strong point in this library, with many of the best patches running on a 'lite' version of Camel Audio's brilliant Alchemy synth. I particularly enjoyed the 'psychedelic techno' arpeggios (which can be sync'ed to host tempo) and the steely, electric-harpsichord-like chime of 'Additive Dream Guitar'. Pop brass is another strong area, providing a selection of effective brass sections and solo saxes. 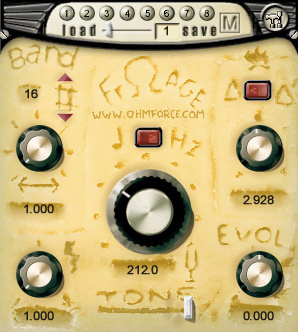 Frohmage, a seriously mad plug-in. Not recommended for those with a nervous disposition, this is one of many VST effects that come bundled with the Receptor VIP.The orchestral section offers some decent options: the harp is cool, the string sections (which include powerful, driving staccatos) will get you through a gig with flying colours, and even the solo violin (traditionally awful in workstations) is usable. Woodwinds such as flute, clarinet and bassoon are nicely sampled, but the solo brass is let down by a lacklustre solo trumpet and a poor solo French horn. Tuned percussion fares well: marimba, xylophone, glockenspiel, crotales and tubular bells all sound very nice indeed, and if the timpani seem a little polite, the exquisitely floaty vibraphone more than compensates. Having torn myself away from the keyboard presets, I plugged my Strat copy into the VIP and dialled up a distortion preset. Soon I was performing death-metal riffs with abandon — distressing for anyone in the vicinity, but a glorious reminder of my youth nonetheless. There are some excellent guitar chorus and delay effects, and the crazy Frohmage plug-in excelled itself by making everything I played sound completely deranged — even 'House Of The Rising Sun' sounded like a Psychic TV remix. I was also pleased to see that Amplitube has a Jimi Hendrix preset; I've always wanted to sound like Jimi, and although there's the minor issue of not being able to play the guitar as well as him, now that I have this plug-in I'm sure it's only a matter of time. For a full list of plug-ins included with the Receptor VIP, see www.museresearch.com/products/receptor-vip.php. The VIP is simple to operate: you can navigate your way around instruments, effects and settings on the front panel by using eight backlit buttons and two control encoders (or 'knobs', to give them their correct technical term). A small, two-line, blue LCD shows which presets are currently loaded. The two knobs double as push buttons; turn them to scroll back and forth through instrument and effects lists, then load your sound by pressing the lower knob. The VIP can simultaneously run up to 16 separate instruments. It defaults to MIDI Omni mode (in which loaded instruments respond to all incoming data, regardless of MIDI channel), but it's simple to assign instruments to specific MIDI channels, layer presets, and even set up keyboard splits if you need them. It's also possible to use a 16-channel multitimbral player (such as Kontakt) on a single Receptor channel. Like other Receptors, this module also functions as a fully fledged effects processor. You can assign different effects to each input, allowing you to (say) add harmonies to a vocal while simultaneously applying Blitzkreig distortion to a guitar (but don't try it the other way round). The VIP can theoretically process a sound source through 16 effects at once, though in parallel rather than in series; however, its two additional 'Mixer Effects' slots allow you to feed the first effect into the second. These slots may also be used to add effects to instruments, the limitation being that the total number of loaded players and effects can't exceed 16. 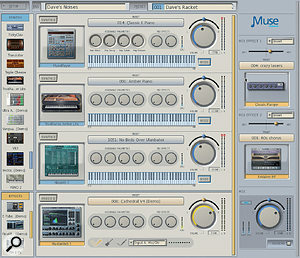 The 'Rack View' of the Receptor VIP's GUI shows available instruments and effects as thumbnails. A total of 16 can be dragged into the central window, with instruments showing at the top and effects underneath. The Mix Effects section on the left accommodates two extra effects, which can be configured as sends or inserts, thus allowing you to add effects to your instruments. An expandable system like this could easily end up holding thousands of presets, so for ease of navigation, the Receptor VIP uses 'Sound Finder' architecture. Presets are separated into style categories known as 'Tags'; you can add your own Tag categories to the existing factory styles, group your gig presets together, and so on. Instrument and effects presets can be saved within the same Tag folder, but to avoid confusion it's better to segregate them. The green 'Play' button on the front panel allows you to quickly browse factory presets. Pushing the 'Edit' button gives access to eight key effects parameters, while other front-panel controls are used to create user set-ups. If you're used to working with computers, you may find the small LCD a little restrictive, in which case you can connect the Receptor VIP to a PC or Mac and see your settings 'writ large' on your computer screen. I connected the VIP to my PC via a router with a standard Ethernet cable. (Apparently, it's possible to make a direct connection with a 'Crossover network cable', but I wasn't sent one.) A small 'Receptor Remote Control' program supplied on CD allows you to display the unit's GUI, view the VIP's HD directory and download plug-ins direct from Muse Research's 'Plugorama' site. 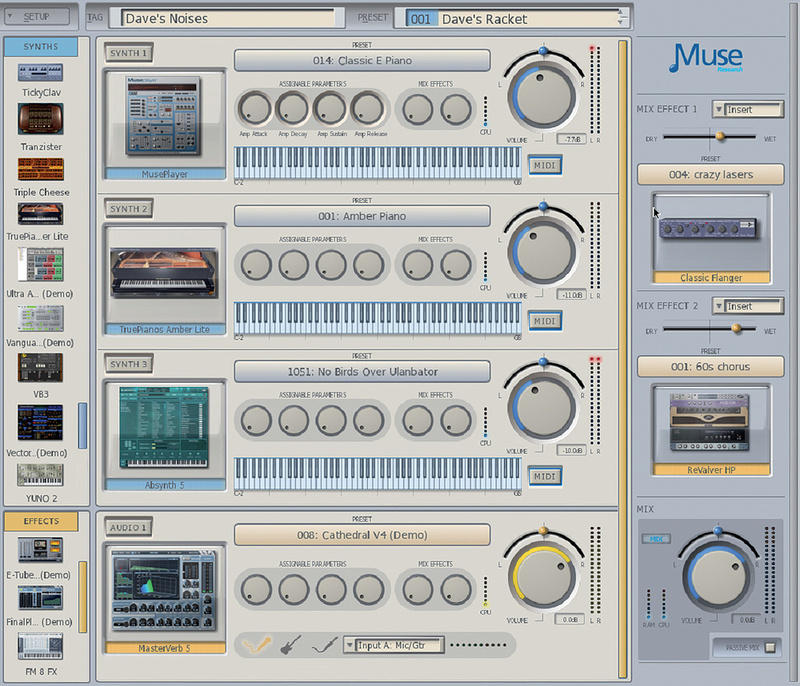 The GUI features the VIP's new 'Rack' style view, which shows available synth, sampler and effects plug-ins as thumbnails that can be dragged and dropped onto a large central window, while mixer effects appear in a strip to the right of the screen. This strikes me as more agreeable than the rather drab Mixer view used in older Receptor models, but that view style is still available if you need it. Switching between the two views routinely caused the Remote Control software to crash, which sometimes required a re-boot of the VIP. The Receptor VIP is a joy to play, with no discernible latency. Its audio quality is superb: the 24-bit/48kHz samples are beautifully clean, the frequency range sounds full and natural, and there's not a hint of noise. If it's used stand-alone, stability is not an issue: the machine didn't crash once in several days of testing. It only froze on two occasions when I connected it to my PC and fiddled with the GUI view settings (not something I would want to do on stage!). The only potential fly in the ointment is compatibility. The Receptor range runs only VST plug-ins; AU and RTAS are not supported, and Mac-format VST plug-ins will not work. Certain player formats remain incompatible: for example, Spectrasonics' Omnisphere synth works, but Vienna Instruments and EastWest Play don't. In the case of Vienna, this is due to their E-Licenser system being incompatible with Receptor's custom OS, but EastWest are currently working on making Play run on the Receptor (no deadline has been given for this). This being the case, anyone considering buying this machine in order to run a particular instrument, library or plug-in should first check with Muse Research to make sure it's supported. While I was disappointed at not being able to play the Vienna collections, the positive clincher for me is that Native Instruments Kontakt sampler is supported, thereby giving access to a large number of top-quality libraries. I can also highly recommend Native Instruments' Komplete 8 bundle (which includes Kontakt 5), which can be pre-installed as an option in the VIP. By combining the functions of virtual instrument player and multi-effects processor in one box, the VIP offers a viable alternative to a computer for live performance and recording. It's by no means a fail-safe escape route from Computer World — to add new instruments and effects you still have to think about installation, downloads, authorisation, Ethernet connections and so on, and that may be a deal-breaker for those who find computers a total turn-off. But for old-school players like myself, the sheer convenience and simplicity of the Receptor's hardware-based approach has great appeal. Australian company SM Pro Audio's V-Machine is a small (18cm wide) desktop hardware unit which runs VST instruments and effects plug-ins. Its system spec (1GHz CPU, 512MB of RAM, 1GB IDE Flash Disk HD) is tiny compared to the Receptor range and it currently doesn't support Kontakt, though it can run many other instruments and effects. The AudioStation from Seelake (Italy) is larger and has a similar hardware spec to the Receptor range, a host of I/O options and a comprehensive range of supported plug-ins. It can also be rackmounted, making it, on paper, a reasonable alternative to the Receptor VIP, albeit with a heftier price tag. The Receptor VIP ships with a 1TB hard drive, which can be substituted for a super-fast 256GB SSD if loading speed is more important to you than disk capacity. Equipped with 4GB of RAM as standard, it runs on an Intel 64-bit, 3GHz dual-core CPU using a custom Linux-based operating system. Both RAM and HD size can be expanded by the UK service centre, currently run by Media Pros. Unveiled at NAMM 2013, the new Receptor Trio and Receptor Quattro models replace the old Receptor 2, Receptor Pro and Receptor Pro Max units at the end of March 2013. The Trio and Quattro come bundled with the Presonus AudioBox 1818VSL, a 1U, rackmountable audio interface which adds extra I/O capability. These two new modules represent the top of the Receptor range, with the Receptor VIP positioned as the entry-level model. Boasting similar specs to the Receptor Trio, the Receptor 2+ Classic is available as an upgrade to older models. The Classic is housed within the old chassis (for which rack ears are an optional extra), and may also be used with the Presonus 1818VSL. Real-time preset changes can be done via a footswitch, a MIDI program change, or (if using the GUI) by clicking on the preset in question. You can also use an iPad, iPod, Android Pad or Android Phone connected to the Receptor VIP via a Wi-Fi router to switch presets. The VIP's 'patch remain' function means you can even hold a note while switching to a new preset, thus keeping embarrassing on-stage silences to a minimum! A reliable, great-sounding, rackmountable hardware unit for playing VST virtual instruments and plug-in effects. Built for the road with no 'wall wart' mains adaptor. Hooray! VST plug-in support is not universal. Gigging musicians who are squeamish about using a computer on stage now have an alternative: the Receptor VIP, a combined virtual instrument player and effects processor housed in a solidly built, rackmountable sound module. Although not all plug-in formats are supported, this box of tricks is open to user expansion and represents an all-in-one, supremely versatile hardware solution to a variety of musical needs. Receptor VIP £1378.24; Receptor VIP with NI Komplete 8 installed £1766.94; Receptor VIP with 256GB SSD £1766.94; Receptor VIP with 256GB SSD and NI Komplete 8 installed £2211.17. All prices include VAT. Media Pros +44 (0)208 400 9400. Receptor VIP $1699, Receptor VIP with Komplete 8 Inside $2099, Receptor VIP with 256GB SSD $2099, Receptor VIP with 256GB SSD and Komplete 8 Inside $2499. Muse Research +1 650 326 5400.